Application for wall or ceiling. Blown from amber smoked glass infused with silica sand dust. Offered in two sizes. Metal structure finish in brushed bronze. Also available in similar pendant application. 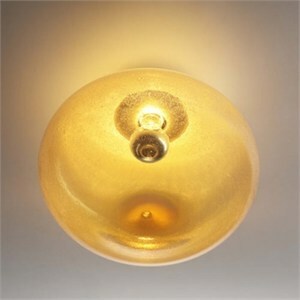 35 (small)- 13.75"D X 10.5"H. Uses 1 X 100W 120V E26 (medium base) A19 silver bowl incandescent lamp. 45 (large)- 17.75"D X 14.25"H. Uses 1 X 100W 120V E26 (medium base) A19 silver bowl incandescent lamp.